← Off to Nanning for the Weekend! That’s what my friend wrote to me the other day. She was trying to make me feel better because my hole currently seems unimaginably bottomless. After 10 years of companionship, Little Flower has left me behind on a journey which now has her frolicking in greener fields than those in this world. It was very sudden, with little warning. After my winter break, where she remained at her sitter’s for 4 weeks, we were back together again and it was a happy reunion for us both. We had finally returned to Longzhou. She and I were having a wonderful Saturday together. We went for a walk. We cuddled on the couch. She entertained my regular teenage visitors, Joe and Tom, when they came for a visit. In fact, I snapped her last photo with the two of them. Then late that same night, around 10 p.m., she began coughing. It was a strange cough, heart-wrenching with hacking in between. After this lasted most of the night, I contemplated taking her to the vet in Nanning (3-hours away) because there are no vets in my area. However, she seemed to recover a bit on Sunday so I thought maybe she was getting better. Yet once again, the cough started up in the night, non-stop and continuous. I stayed with her while she lay in her travel carrier, which has always been her comfort zone. Feeling bad? Scared? Unhappy? Into her travel carrier she’d go. Monday morning, I taught my first class of the day then called a private taxi driver to take us immediately to the capital city. My hope was that the vet could take good care of her. I had every confidence she’d be just fine once she was in proper hands. This illness was just too sudden to be life threatening, right? The vet clinic was near the hotel I stay at when swimming in Nanning. I had found this clinic 3 years before, knowing that some day, I might need a good vet. Dr. Zhang was a young man who had graduated 5 years ago from the Guangxi Agricultural College as a veterinarian. His clinic was equipped with everything needed for basic needs in animal care. I’d never had need of him before until now. Dr. Zhang and his partner both took blood samples but the main report would take 4 hours to get back before they knew what treatment to give. It was around 4 p.m. at that time. LF was hooked up to an IV and I thought she was in good, capable hands. I decided to leave to teach class back in Longzhou the following day. If I needed, I’d return to check on my dog the next day, even though it would be a 3-hour journey back again. That, of course, was a mistake. LF died the next morning of heart failure, which was what the test results showed was wrong with her. There was nothing anyone could do. No medicines to cure her. Her little heart just gave out. While there is some comfort that I could never have saved her, I will always regret that I left her by herself in a strange place to die all alone. She must have wondered where I had gone. I’m sure she waited expectantly for me to return. It still hurts to think about that so I try not to. After Dr. Zhang called me to say LF was no longer with us, I left for Nanning to bring her home. I called our campus leader, Mr. Luo, to ask his permission to bury LF at the school. He was very kind and said not a problem, only he didn’t want me to bury her in front of the administration building and no monument! I thought that was rather funny. The administration building has no grass around it so it would be rather difficult to bury her there. And, secondly, I hadn’t thought about a monument or plaque of any kind. I just wanted to do it quietly, without any fanfare, in an out-of-the-way place. I guess, according to Dr. Zhang, some pet owners like a tombstone of some sort so they can visit every year to remember their pet. He even told me he could arrange it outside of town if I wanted. There are companies that do that sort of thing. It wasn’t cheap, but it was available. Another option was for me to pay him 100 yuan (about $16) and he’d have someone come pick her up and bury her outside of town. I wasn’t exactly sure about that one. What if I paid him the requested amount, he called the person, handed over the 100 yuan and the person took the money then dumped the dog in a garbage can somewhere? That’s why I brought her back to our campus so I’d know where she was. I wasn’t about to let someone else take care of my little dog. As a pet owner, that’s my responsibility. I was very grateful to have one of the English teachers here, Margaret (Zhou Ying), help me in this venture. Margaret was LF’s sitter during my weekend trips to Nanning. She would take care of her while I was gone. I was Mother 1 and she was Mother 2 so it was only fitting that Little Flower’s two parents be present at her burial. 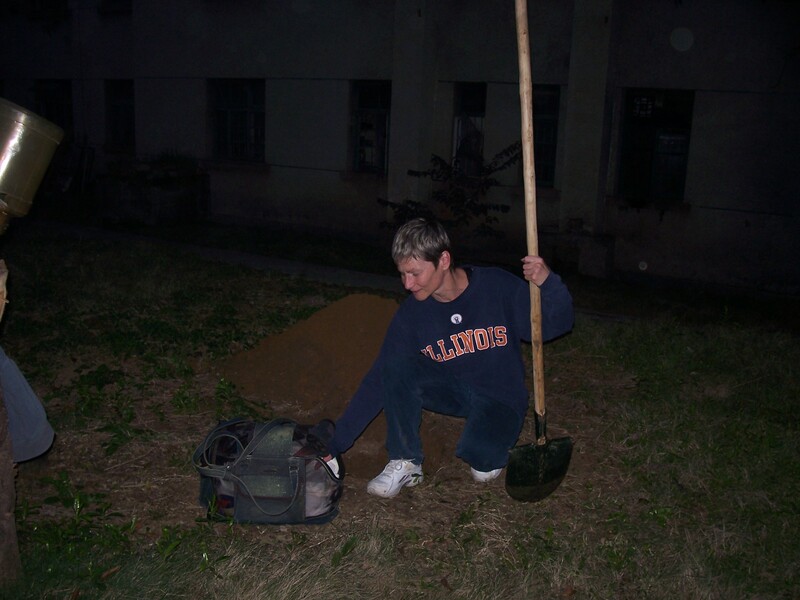 Margaret was also gracious enough to borrow two shovels from the school supply room so we could work together after we found a proper site for LF’s final resting place. We eventually chose behind my apartment building, under a tree. From my back apartment windows, I could look out to see her every day if I wanted. Margaret and I took turns with our shovels. It was a heavy job to dig a hole deep enough but we managed together. 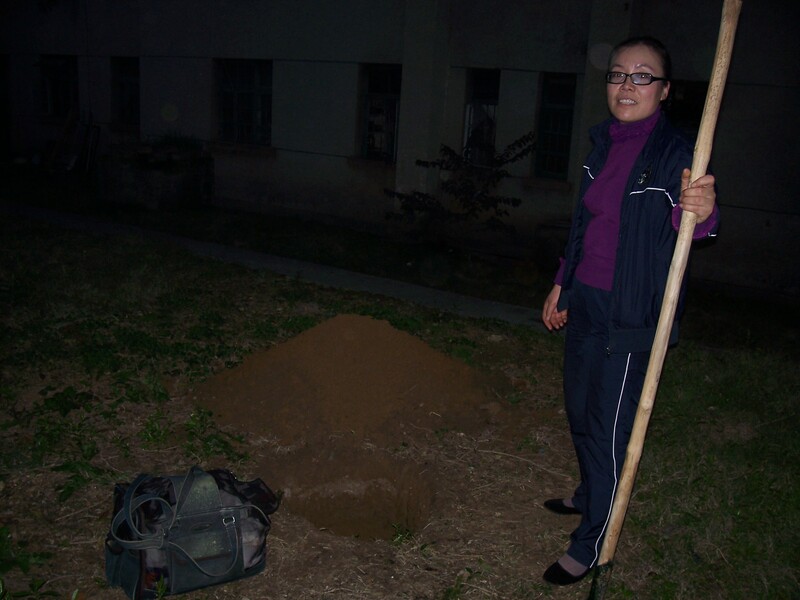 Margaret (shown here) and I took turns digging for LF’s burial. Me, saying goodbye to my little dog. LF was wrapped in a towel. We said our goodbyes and then began filling the hole again with dirt. Margaret’s husband drove up on his scooter and helped us finish. He understood the bond we both had with LF. It was a kind gesture and I truly appreciated it. Margaret’s husband showing his support for our loss. After 10 years of having a companion in everything I did, it’s very hard to be without that special little someone around. 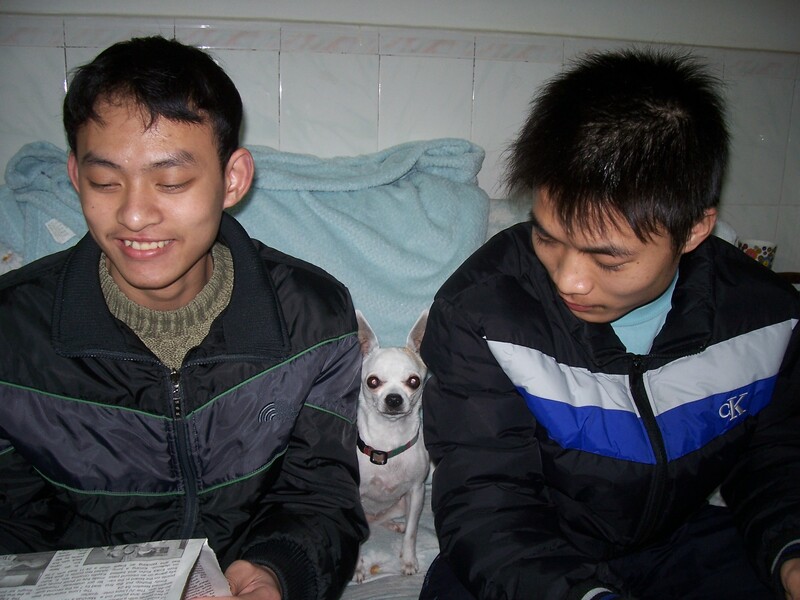 The Amity Foundation, my partner organization in China, does not allow teachers to have pets. This rule was established 7 years ago. But because I already had my little dog, an exception to the rule was made for me with the understanding that when LF died, I would not be able to have another one. I truly thought my dog and I had a few more years left before I would have to deal with such a sad situation but it looks like that wasn’t the case. So I have to deal with it now. All I can say is, it’s hard. I miss her. She was the brightest spot in my day. That empty place she left me with is difficult to fill right now. I am grateful to so many of my American friends who have sent their words of encouragement, telling me that it’s OK to feel sad and time will heal. My students are also very sweet. They have expressed their sympathy in little ways so as not to make me feel worse. Teaching them and spending time with them brings me great joy. And attending worship at our little Longzhou church every Sunday is yet another blessing in my life. I was especially moved by the sellers in town who always asked about Little Flower on numerous occasions. We sometimes went shopping together. I would take her around to the meat market, the fruit stands, the candy seller and the bakery to pick up my favorite bread buns. All of the sellers received the holiday photo of me and my dog together, which they placed in their stalls. Whenever I stopped by, they’d point to the picture and smile. They still do, even though they know LF is no longer with me. The candy seller, Ms. Tan, was truly touched when she heard about my dog. It had been our custom that, when LF and I came to her booth, she’d give my dog a free piece of hard candy. LF loved hard candy. She would sit on command and wait anxiously for me to unwrap it and give it to her. Then she’d crunch it down while people stood around us, laughing, making comments and admiring her trick. 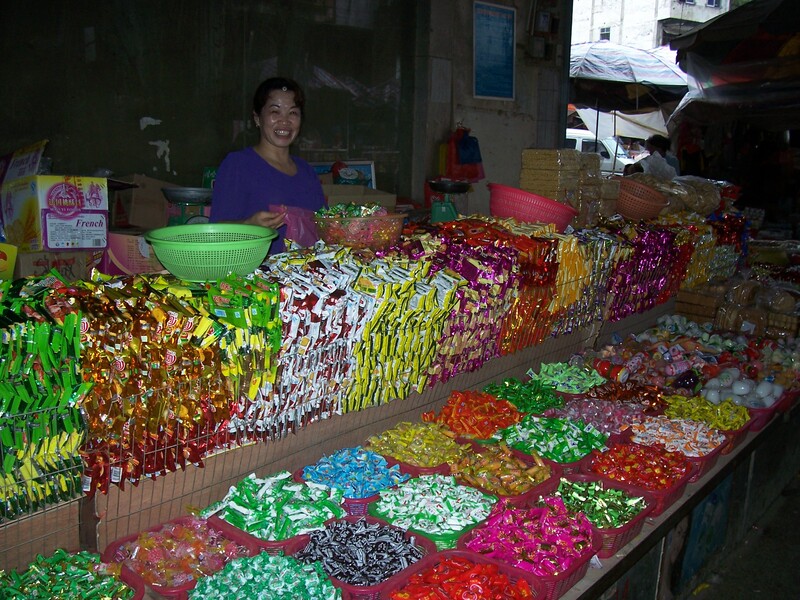 Ms. Tan, in her candy paradise, always gave away a butterscotch to LF on her visits. After LF’s death, I arrived at my usual candy place alone to pick up goodies for my students. “Where is Little Flower?” my seller asked cheerfully when I walked up to her area. “Oh, Little Flower died,” I told her sadly. I loaded up the container baskets with candy selections while she silently watched me. After weighing all my handfuls, she calculated the cost to be 35 yuan ($5.55). When I handed over the money, she waved off 5 yuan to round off my amount to an even 30. Nothing was said. She just gave me an understanding, sympathetic nod. What an unexpected act of kindness: 55 cents of her much-needed profits, extended to me for the love of my little dog. That, and the most generous condolence gesture I could ever receive: a single, wrapped piece of butterscotch candy (LF’s favorite) which she hastily thrust into my hand as I departed. A last gift for a beloved little dog, now barking in the great beyond. From Longzhou, here’s wishing you Ping An (Peace) for your day. Little Flower’s last photo with Joe (left) and Tom (right). Goodbye, Xiao Hua (Little Flower)! You are really missed. This entry was posted in Along China's Li River: Longzhou, Guangxi. Bookmark the permalink. Connie, I am so sorry about Little Flower ! I loved hearing about her. My favorite story was her getting on the elevator without you while on vacation. When the door opened she looked at you like “Well, come on” ! She did the Lord’s work wherever she went, loving everyone she met. I know it will take time for your heart to heal, I will keep you in my prayers.